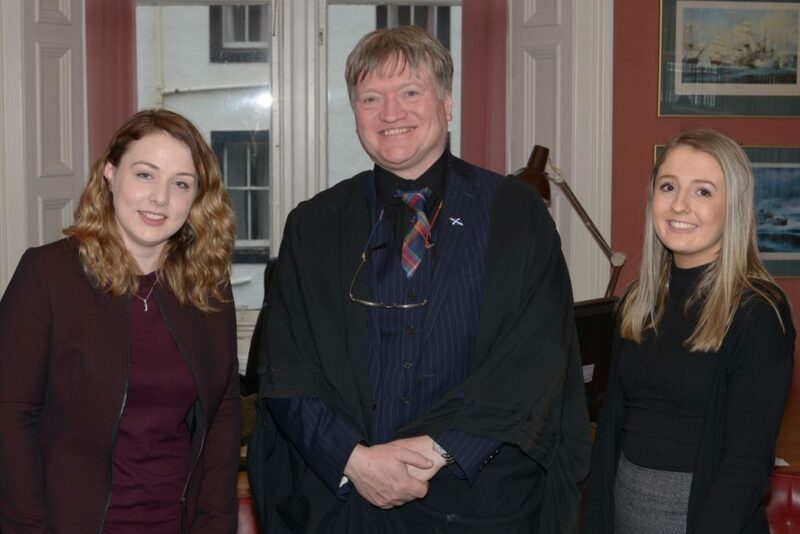 A pair of Campbeltown’s newest recruits to the legal profession met the president of the body which governs solicitors. Shannon Binnie and Jennifer Kelly heard the Law Society of Scotland 2017/18 president, Graham Matthews, give a brief outline of the organisation’s current work at a reception hosted by Campbell Read of Stewart Balfour and Sutherland (SBS) on Tuesday evening. A select group of legal professionals attended the meeting: Argyll and Bute council’s Charles Reppke, Christian Kane and Stephen MacSporran from McTaggart Solicitors, SBS solicitor Fiona McLeaod and paralegal Jan McCorkindale. In addition the Law Society’s head of high street member engagement, Katie McKenna and a council lay member, John Reid, travelled to Kintyre. Ms Binnie and Ms Kelly have been recruited as trainee paralegals with the Castlehill partnership and are currently taking a one year course through the University of Strathclyde. Mr Read said: ‘We have decided to grow our own due to the difficulties in recruiting trained staff. As a firm we always try to employ locally. Mr Read added that SBS has recently taken on staff, merged with a firm in Oban and opened an office in Skye with the aim of building a strong west coast practice. Mr Matthews returned to Inverurie, in his native Aberdeenshire, after qualifying in Musselburgh in 1981 and has never left. He backed up Mr Read’s training ambitions. He said: ‘One of the messages I try to get across is that rural Scotland is a good place to live.